JUDY WOODRUFF: Before we go, a final send-off fit for a queen. Aretha Franklin was remembered in a daylong epic service. Jeffrey Brown captures some of the emotional and inspiring moments of this day. JEFFREY BROWN: The Queen of Soul, Aretha Franklin, was laid to rest today in her hometown of Detroit with a grand celebration of her life and legacy. There was love from family, fond memories from luminaries of all kinds. And, of course, there was music, beautiful and rousing music, in tribute to one of the greatest musical stars this country has ever produced. The service capped a weeklong send-off that drew lines of fans, paying their respect to the legendary singer who died of pancreatic cancer on August 16 at age 76. Outside, more than 100 pink Cadillacs surrounded the Greater Grace Temple, where the funeral was held, setting the tone for the extravagant event that ran more than five hours. Inside, presided over by Bishop Charles Ellis, prayer, Scripture, and a gospel choir welcomed the large crowd of friends and family. Aretha Franklin came from the church. Her father was a prominent pastor. And gospel was always present today. Today, leading gospel singers, such as the Clark Sisters, sang their tributes. One of today's biggest pop stars, Ariana Grande, took to the podium for a rendition of Franklin's classic song Natural Woman. Later, one of Franklin's grandchildren spoke to and of his famous grandmother. MAN: You showed the world God's love. And there's nothing more honorable. JEFFREY BROWN: One after another, they came to the podium. Smokey Robinson, another legendary singer from Detroit, spoke and sang directly to his childhood friend. SMOKEY ROBINSON, Musician: So now my longest friend has gone home. And you want to be with our father, like we all have to do one of these days. And I know you're up there, and you're celebrating with your family. And you are gonna be one of the featured voices in the choir of angels. JEFFREY BROWN: Former President Bill Clinton spoke of his earliest memories of Aretha Franklin and her music. BILL CLINTON, Former President of the United States: Started out not as the president and first lady, the senator, or secretary of state. We started out as, like, Aretha groupies or something. She lived with faith, not without failure, but overcoming her failures. She lived with power, not without weakness, but overcoming her weaknesses. I just loved her. JEFFREY BROWN: Ninety-three-year-old Cicely Tyson took the stage and spoke of the emotion Franklin's voice evoked. CICELY TYSON, Actress: She spoke to us through her soul. And that's why, no matter what she was singing, she moved every single person. JEFFREY BROWN: And throughout the afternoon, the music continued. Chaka Khan brought the church to its feet through the gospel song Going Up Yonder. And, in a grand finale, Stevie Wonder rounded out the service. 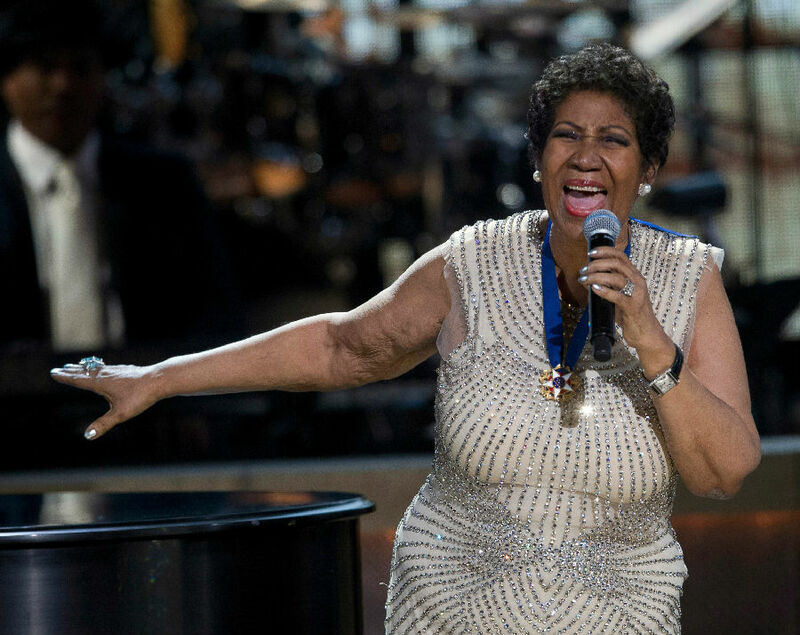 Aretha Franklin, a musical titan and American icon who touched millions of us, given a rousing tribute overflowing with gratitude. She will be buried in Detroit's Woodlawn Cemetery, the same resting place as her late family members and Rosa Parks. For the PBS NewsHour, I'm Jeffrey Brown. JUDY WOODRUFF: A fitting farewell for the one and only. All the people in the buildings came to give me a rousing send-off. The once powerful figures have also disappeared from the scene one after another. Her heart overflowed with love.